The integration of basic and clinical sciences remains a constant challenge for educators and scholars across the health professions. “Curriculum integration” is a popular concept, but one that has multiple – and occasionally conflicting – meanings. This presentation will review how curriculum integration can be misunderstood by basic science teachers, clinical teachers and students. Dr. Woods will highlight different perspectives on the concept of curriculum integration and reconcile these perspectives using theories of learner cognition and expertise development. Nicole N. Woods, PhD is Director of The Centre for Ambulatory Care Education (CACE) at Women’s College Hospital and Scientist & Associate Director of The Wilson Centre, Faculty of Medicine, University of Toronto at University Health Network. Dr. Woods joined the University of Toronto in 2006 and leads a successful program of research in health professions education. A cognitive psychologist by training, her work focuses on the role of biomedical knowledge in clinical reasoning and the value of basic science training in the development of medical expertise. Dr. Woods is currently Associate Professor in the Department of Family and Community Medicine and an Education Scientist in the Office of Education Scholarship. In 2017, Dr. Woods was appointed the inaugural Scientific Director of the Research Institute for Health Care Education at UHN. 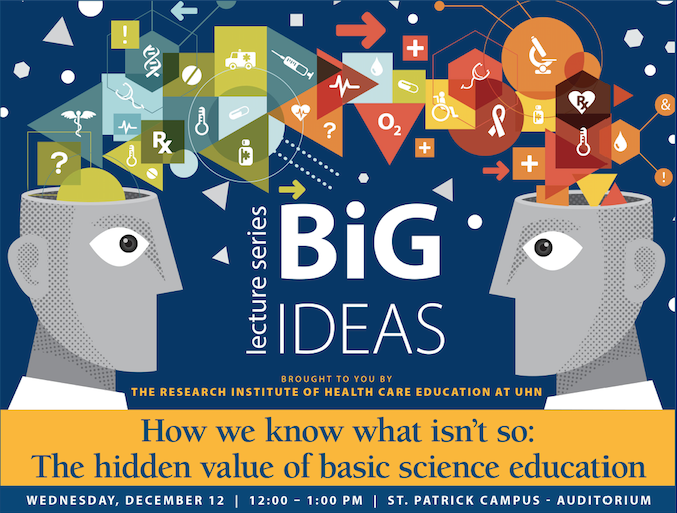 Please click here and register for Big Ideas Lecture Series: “How we know what isn’t so: The hidden value of basic science education” on Dec 12, 2018 12:00 p.m. EDT.